No book on Black history – indeed the history of America, which we can safely call Amerikkka because of the rise of the kind of fascism that the ku klux klan stands for – is complete without an extensive chapter on The Last Poets. The Last Poets are several groups of poets and musicians who arose from the late 1960s African-American civil rights movement’s black nationalism. The name is taken from a poem by the South African revolutionary poet Keorapetse Kgositsile, who believed he was in the last era of poetry before guns would take over. The original users of that name were the trio of Felipe Luciano, Gylan Kain, and David Nelson. The Original Last Poets were formed on May 19, 1968 (Malcolm X’s birthday), at Marcus Garvey Park in East Harlem. On October 24th 1968, the group performed on pioneering New York television program Soul!. In 1972, they appeared on Black Forum Records album Black Spirits – Festival Of New Black Poets In America with “And See Her Image In The River” and “Song of Ditla, part II”, recorded live at the Apollo Theatre, Harlem, New York. A book of the same name was published by Random House (1972). The original group actually consisted of Gylan Kain, David Nelson and Abiodun Oyowele. Nelson left in the fall of 1968 and was replaced by Felipe Luciano, then Luciano left to start the Young Lords and was replaced by Alafia Pudim (later known as Jalaluddin Mansur). Following the success of the reformed Last Poets first album, Luciano, Kain, and Nelson reunited to record their only album Right On in 1967, the soundtrack to a documentary movie of the same name that finally saw release in 1971. Their song “Wake Up Niggers” was part of the soundtrack of the 1970 film Performance which also featured Mick Jagger. 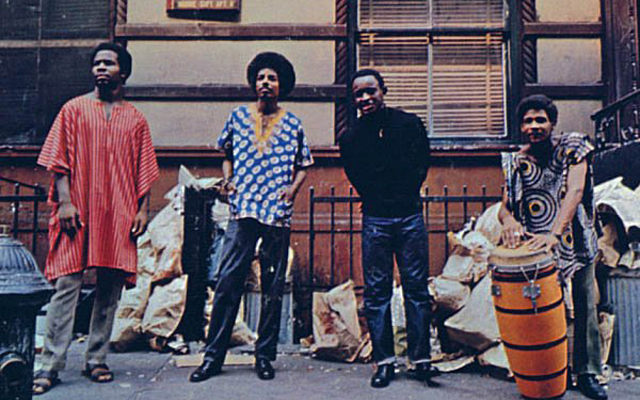 The Right On album was released under the group name The Original Last Poets to simultaneously establish their primacy and distance themselves from the other group of the same name. 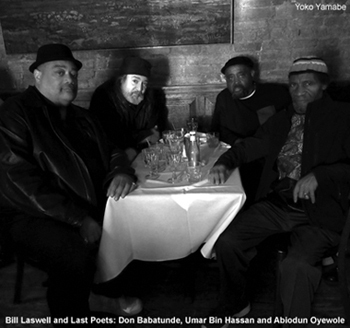 The Jalal-led group coalesced via a 1969 Harlem writers’ workshop known as East Wind. Jalal Mansur Nuriddin a.k.a. Alafia Pudim, Umar Bin Hassan, and Abiodun Oyewole, along with poet Sulaiman El-Hadi and percussionist Nilaja Obabi, are generally considered the best-known members of the various lineups. Jalal, Umar, and Nilaja appeared on the group’s 1970 self-titled debut LP and follow-up This Is Madness. Nilija then left, and a third poet, Sulaiman El-Hadi, was added. This Jalal-Sulaiman version of the group made six albums together but recorded only sporadically without much promotion after 1977.